In February 2014 the Minnesota Renewable Energy Society headed up a team that was chosen to conduct an assessment of the distributed wind market in Minnesota by the Minnesota Department of Commerce.The team consisted of Laura Burrington (MRES), Brian Ross and Abby Finis (CR Planning), Fritz Ebinger (MN Project), John Dunlop (Renewable Energy Services) and Heather Rhodes Weaver (eFormative Options). 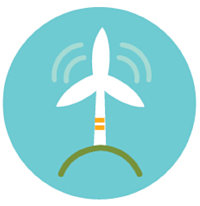 As a result of these assessments the team put together a series of webinars and concluded with a series of recommendations to move forward the distributed wind industry in Minnesota. We have created this page to provide these resources to the public. This project was made possible by funding from the Minnesota Department of Commerce.